Now made with Local wildflower Honey or Coconut Palm Sugar in the spicy blends! Call for price inquiries on special orders/wholesale inquiries. Barks – All bark are packaged in 2oz biodegradable vegetable based plastic. Ship in 12ct cases. ** “CINOTLE” – 70% Cacao with Strong flavor of Red Ape Cinnamon &amp a hint of smokey Chipotle spice sweetened with coconut sugar. ** “CREAMY CHICO CHAI” – 54% Cacao creamed with coconut butter enhanced with Chai infused coconut sugar. Desserts – Chocolates, Tortes, Pies, Cookies, Cashew Cheese Cakes, Trifles, Petit fours, Tarts & More! If it’s chocolate We Can Do it! Just ask and your heart will sing with Pure Joy! I’m not one to ever leave comments/reviews but this is seriously the most incredible chocolate I’ve ever had so far. It actually made my day so thank you. 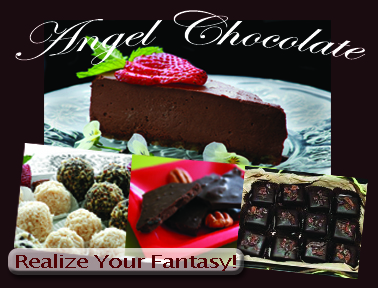 Thank you for sharing your delight in our pure love for all things chocolate!!! Hope we will continue to enthrall your taste buds with new experiences.